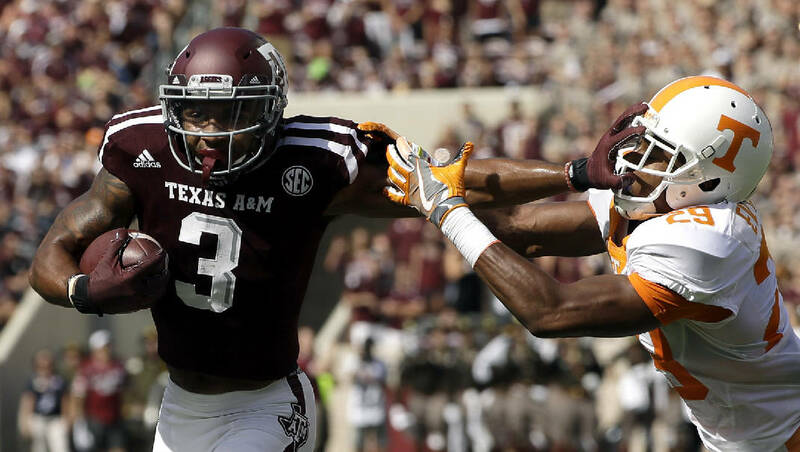 Texas A&M wide receiver Christian Kirk breaks away from Tennessee defensive back Evan Berry during their SEC matchup last October in College Station. Texas A&M wide receiver Christian Kirk goes airborne as he is tackled during last November's game against Mississippi State in Starkville. 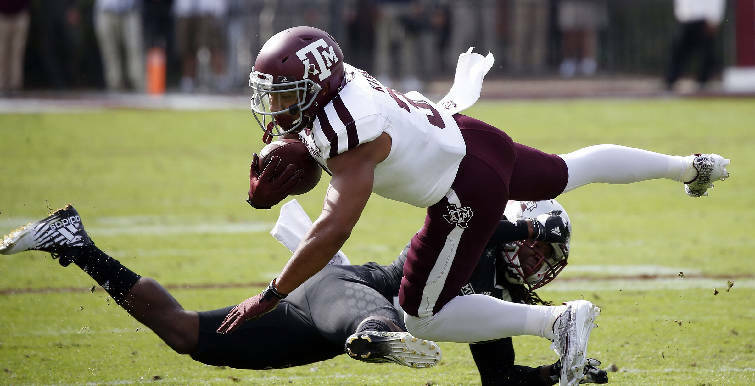 Texas A&M receiver Christian Kirk amassed 83 catches for 928 yards and nine touchdowns last season as a sophomore, racking up 11 more catches than anybody else in the Southeastern Conference. Yet scoring receptions are not his favorite part of the game. "I probably appreciate a punt return more, just because they don't happen as often," Kirk said at SEC media days. "I really respect the guys who go out there and block for me on punt returns, and all the guys on special teams in general." The 5-foot-11, 200-pounder from Scottsdale, Ariz., has plenty of experience getting into the end zone on special teams as well, entering this season with five career punt returns for scores. Three of those scores occurred last season, when Kirk averaged a healthy 21.7 yards per return. That stat would have led the nation by more than 2 yards a return, but his 13 opportunities were not enough to qualify. His average in 26 career college games is a staggering 23.1 yards. "Everybody knows that Christian Kirk is one of the best football players in the country," Aggies coach Kevin Sumlin said. "He's a guy who's dynamic — so you put the ball in his hands as a returner — but has also become a dynamic weapon as a pass receiver." Texas A&M entered last season with several heralded receivers, but it was Kirk and Josh Reynolds who separated themselves from Ricky Seals-Jones and Speedy Noil. The Aggies ranked fourth in the league in passing offense a year ago, averaging 255.2 yards per game, but that was mostly behind the arm of Trevor Knight. › Fun fact: Texas A&M has won 15 consecutive games in August and September since a 49-42 home loss to Alabama in 2013. Kyle Allen and Kyler Murray were the quarterbacks throwing to Kirk two years ago, and what has been a turbulent position since Johnny Manziel's departure after the 2013 season in College Station remains an uncertainty. Senior Jake Hubenak returns the most experience, having completed 61 of 104 passes for 844 yards with six touchdowns and two interceptions a year ago, while freshman Kellen Mond of San Antonio has the most hype. "It hasn't been too difficult," Kirk said of the quarterbacking carousel throughout his career. "We've been able to set a standard as a receiver group, and I believe we've been able to live up to that standard and make plays. It's the quarterback's job to put it in our area, and we've got to make plays. "In the SEC, you're going to be making competitive catches every down, and you've got to make those 50-50 balls." Kirk, who admired Odell Beckham and Amari Cooper before he entered the SEC, has lived up to his five-star billing from the 2015 signing class and then some. Yet he has not been able to reverse Texas A&M's recent trend of entering October undefeated and highly ranked only to collapse down the stretch. Texas A&M has experienced three consecutive 8-5 seasons that have ended in the Liberty, Music City and Texas bowls, and that has Sumlin arguably on the hottest seat of any coach in college football. The Aggies return just five starters on offense, and their seven returning defensive starters do not include ends Myles Garrett and Daeshon Hall, who are now in the NFL. "We battled some injuries last year, but everybody battles injuries in the middle of the season," Kirk said. "To be a top team in the SEC, you've got to be able to go out there and play those LSUs and Alabamas the second half of the season, especially when you're banged up. "We've got to control what we can control. We've got to focus on us and what we can handle. Coach Sumlin doesn't go out there and play on Saturdays, so that's up to us. We've got to be better as players."